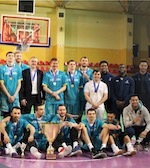 BC Astana conquered Kazakh Cup title. 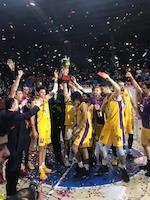 They edged their arch rivals Barsy Atyrau in the Final. Rustam Yergali (194-G/F-86) scored 20 points to lead the winners. Barsy Atyrau enjoyed the better start to the game. They posted a 21:17 lead after ten minutes. But Astana struck right back. They went on a 20:10 run in the second quarter to gain a 37:31 halftime lead. Astana used a 23:16 rally in the third term to open a 13-point lead heading into the fourth frame. Barsy limited their opponents to just 12 points in the final period but could not avoid the loss. Alexandr Zhigulin (205-F-94) finished with 15 points for the winners. Ivan Evstigneev (193-F/G-99) answered with 17 points for Barsy Atyrau.